Since the nineteen-eighties, Debra Phillips has consistently produced and been highly regarded as an artist and a teacher for her work in photomedia. Phillips’ work has made a significant contribution to Australian art/photographic history, notably through her continued investigation into both ‘natural’ and made systems through a kind of photographic indexing. As academic Geoffrey Batchen writes, ‘indexicality ... is a major source of photography's privileged status within modern culture. For, unlike other systems of representation, the camera does more than just see the world; it is also touched by it.’1 With this in mind, Phillips’ work is often both formally and conceptually concerned with the limitations and contradictions of humanity’s notion of knowledge or progress and the material realities of our planet. In this series, the alphabet serves to impose a human logic upon something which functions outside of such concepts. The assignation of this human ‘code’, a series of letters, is meaningless to the termites whose environments are documented. In this way, through the disjuncture between title and photograph, Phillips points to the paradoxes inherent to our attempts to classify things or pin them down within categories. 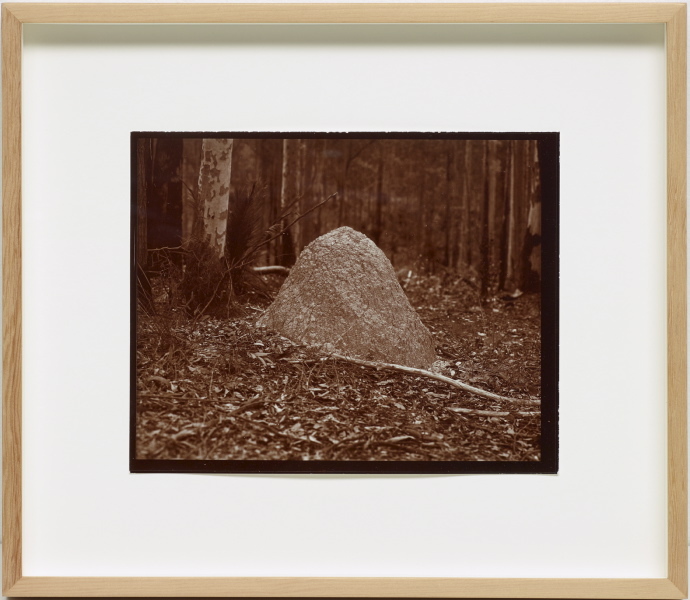 The process Phillips has used is unusual, and is an example of the artist’s continued exploration of different photographic methods and printing systems. The negatives, which were created using a large-format (8 x 10 inch) film camera, were then scanned digitally and output onto larger sheets of printing-out-paper (P.O.P.). These sheets, which became the final prints, bear a silver chloride and gelatin emulsion coated onto double weight fibre base paper stock. The slight variations in tone are due to this now antique and nearly obsolescent process. Importantly for Phillips, the image takes up the entire page, so the image’s ‘border’ must be considered part of the work as a whole. This is reinforced by her choice to frame the prints floating on white in light brown wood frames. Arguably this floating, borderless image is a way of reflecting on the strange process of using a technological and particularly human apparatus to document photographically something that is neither human nor technological, and which provides a counterpoint to those standards. The termite mound is perfect in its own way.